Well shopping kinda failed today considering I slept about 3 and a half hours last night and didn't think it would be safe to drive on so little sleep. Spent the day looking at Christmas Hampers (seriously there are so many to choose from) and packing jewellery orders. Pretty average/boring/standard. Ive been craving a Nandos all day, fingers crossed I'll make it to Birmingham tomorrow and I can get one! Omnomnom. This outfit is from a few days ago when I was deciding if I should keep the dress or not. I really like it, but I decided not keep it as its a little tight across my ample bosom and rather short, even for me. I didn't really like it worn with leggings either, then add my usual heels in it just looked like I forgot to put a skirt on, so it just seemed silly to keep it. DRESSES Y U SO SHORT AT THE MOMENT! I normally have the problem with them being too long! Im 5ft5, hardly a giant! Love this outfit! Did you get that jacket in Primark long ago? I love the dress and the fact that it matches your lippy! But if you are never going to wear it, you might as well return it, indeed. I had the same problem with missguided, but I sort of expected it being on the taller side. It's such a shame though because they have some lovely stuff on there! Such a shame the dress was no good, it's a gorgeous colour! Love the nail polish, gorgeous colour. Loving the colour co-ordination between the frock and your lippy! Shame the dress is too short! I like the dress, it's a lovely colour, but could be a much better fit. The pink is nice against the black leather though too. I have to finish my Christmas shopping tomorrow too and am not looking forward to it, it's gonna be busy eek! I love the colour of that dress it looks so pretty with your hair/skin-tone. I totally have the 'short' issue too and it drives me mad. It seems even though I'm only 5"4.5 dresses seem to want to jussst skim my crotch. Ridiculous seeing as like you I'm hardly giant material?! I feel like as I was such a micro miniskirt advocate between 15-18 they're coming back to bite me now. gorgeous dress! i love the shade of pink it is, shame you had to send it back! I really love this nail varnish and totally agree with your point about dresses becoming inconveniantly short! I love websites like missguided and boohoo but being 5"10 I can never get away with their dresses which makes me sad! They should totally make a tall section already!! I love the dress - and that nail polish is so festive! That dress is such a gorgeous colour, it really suits you. Such a shame it wasn't right, I hate ordering something online and then when it arrives it's not as good as you expected! This dress is really cute ! 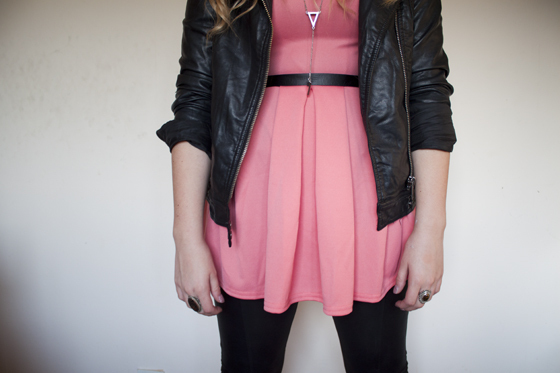 I love the mix between pink and leather ! Love the nail polish, so festive! I know what you mean, dresses ARE getting shorter... 'cos I'm definately not growing..
can you do a tutorial abpout how you put these amazing waves in your hair? You look so great!!!! 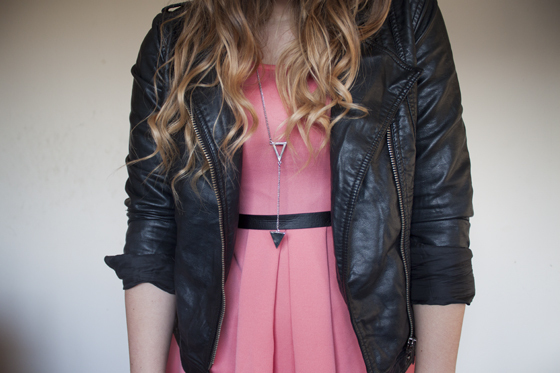 This dress is adorable and the nail polish is amazing, love it so much! Your hair looks great here! How have you curled it? Please don't say it's natural! 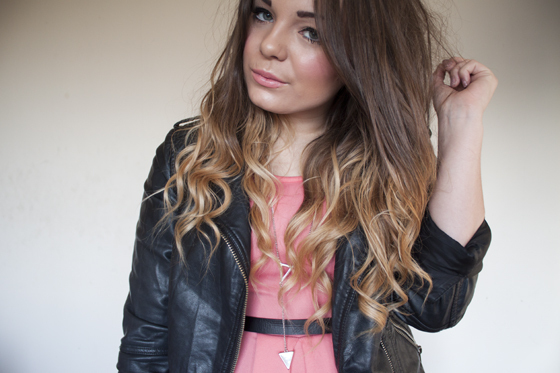 Where is your leather jacket from?! I'm 5ft 11in so everything is like a top to me! Your hair looks lush!! 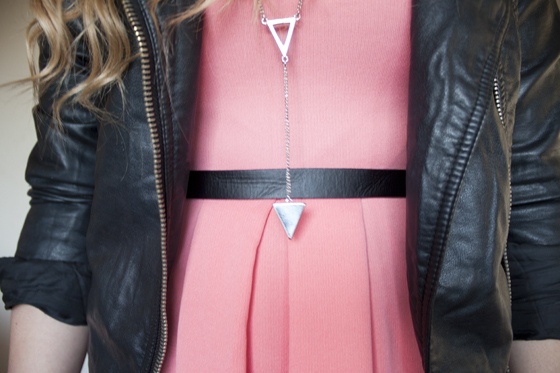 Adore the necklace too! The dress is a gorgeous colour, it looks so pretty. Hey! that cute outfit! love your dress! very cute! What does Black Mamba mean? And your style is unreal! i looovvvveeee it !